If you have an indoor compost bin (either a collector or a worm bin), you most likely have to deal with fruit flies on occasion. Vinegar in glass, plastic wrap on top, pierce with sharp implement to make a small hole, and set on counter (I find that near the kitchen sink is the best. That’s it. 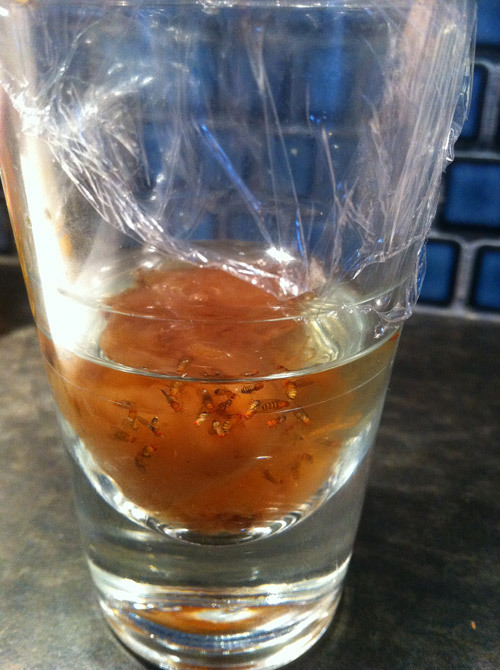 The fruit flies are attracted by the sweet smell coming off the vinegar, get trapped in the glass (because they don’t have problem solving skillz – yes, that’s a zed), and get pickled in that which they love. Mmmm… pickled fruit fly. I’m trying it. Hopefully it works for me too.